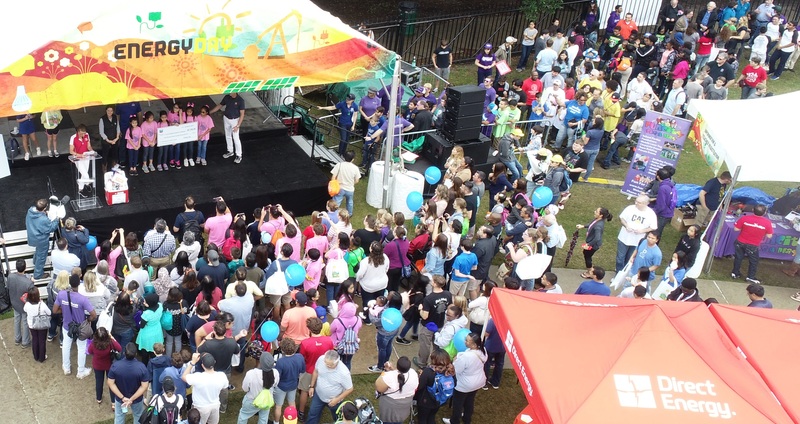 HOUSTON – October 20, 2018 – Families, students, educators, and local industry leaders gathered at Sam Houston Park in downtown Houston this past Saturday for Houston’s Eighth Annual Energy Day Festival, hosted by the Consumer Energy Education Foundation (CEEF), along with its partner Consumer Energy Alliance (CEA). The free event – which is now the largest energy-focused festival in the nation — centers on celebrating the importance of science, technology, engineering, and math (STEM) education and their innovative impact on the energy industry. Energy Day Festival featured more than 60 interactive exhibits and demonstrations, from several of Houston’s leading companies – including Caterpillar, Chevron, Conoco Phillips, Direct Energy, Golden Pass, Noble Energy, Phillips 66, TechnipFMC, Telemundo and TransCanada. Each exhibitor was on hand to greet, educate, and entertain what Houston Police Department estimated to be more than 25,000 people who attended despite the rainy weather. From robots demonstrations by FIRSTRobotics and Microsoft to LEGO engineering and rocket-making, this year’s exhibitors showcased cutting-edge technology in an accessible format to students as a way to excite the next generation about career opportunities in the energy industry. Each year as part of the Energy Day Academic Program (EDAP), CEEF and CEA partner with local and regional STEM-focused competitions in technology, computing, robotics, and inventions, and the winning teams and students are awarded onstage at an awards ceremony at Energy Day in the fall. These programs provide students with opportunities to learn about robotics, STEM and engineering concepts, problem-solving, teamwork, and technical applications. Competitions include the SeaPerch Challenge, MATE ROV competition, the All Earth Ecobot Challenge, The Science Engineering Fair of Houston, The Houston Affiliate NCWIT Aspiration in Computing Award, the CSTEM Challenge, the Young Inventors’ Showcase, the Energy Day Art, Essay, & Media Contest, and the John Kingsley Kerver Educator Award. 2019 will see several more competitions added to EDAP: National Ocean Sciences Bowl (NOSB), International Sustainable World Energy Engineering Environment Project (ISWEEEP), and the Conrad Challenge. During the awards ceremony at 2018 Energy Day Houston, partners and sponsors awarded over $24,000 to 184 students and teachers in 11 categories. Since EDAP began in 2011, CEEF and CEA have awarded nearly $130,000 to more than 800 K-12 students and teachers at the Energy Day Festival. For more on this year’s festival – including photos and videos – please click here. The next Houston-based Energy Day is scheduled for Saturday, October 19, 2019. For more information on the festival, visit the Energy Day Houston website. ← What’s Your STEM Story? © CEEF All rights reserved.